David Goldsmith is a consultant, advisor, speaker, telecast host and author. He is the president of Goldsmith Organization and holds an MBA from Syracuse University. Through his work with leaders from around the globe, David is the developer of the Enterprise Thinking model, a holistic approach to leadership and management based on the activities and tools that all decision makers need to solve challenges and create opportunities. David was named by Successful Meetings Magazine as one of the Top 26 Hottest Speakers in the speaking industry. 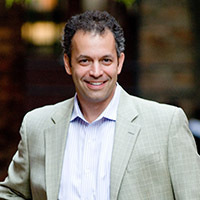 He received New York University’s SPCS Excellence in Teaching award for developing and teaching two core courses, and his history of business success earned him The Citizens Foundation of Central New York’s Entrepreneur of the Year Award and the Central New York 40 under 40 Leadership Award. He serves on the national board of directors of the Institute of Management Consultants and hosts the organization’s telecast series, Consultapalooza. David is also the founder and telecast host of the New York State Chapter of the National Speakers’ Association. In addition to authoring more than 500 published articles, he is a regular columnist for several organizations and publications. David resides in Manlius, NY with his wife and two sons.